X-Men Unlimited (1993) #17 NM- 9.2 Marvel,Wolverine vs Sabretooth; $4 Flat-Rate! 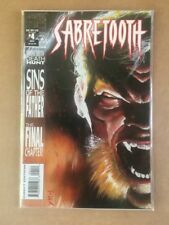 Sabretooth #4 (Dec 1993, Marvel) comic Book In Excellent Condition! New ListingSABRETOOTH Mini series complete. 1993. 4 book lot. High grade VF/NM. Must see.